The contemporary painter creates flat, graphic, realistic images with a dollop of Pop. Plants, pots, flowers, birds, cats, dogs, modernist furniture, books, toys—even a kitchen sink. And a toilet. 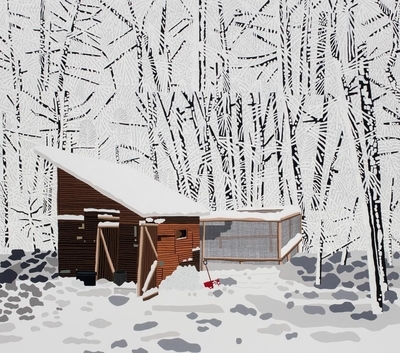 From these quotidian objects, along with his relatives and associates, Jonas Wood fashions large, lush, dense paintings that reflect his life and his surroundings, not necessarily as they occurred but as filtered through his memory and his emotional mind-set. Visually, these paintings are striking, as visitors to "Jonas Wood"—a midcareer survey for him—at the Dallas Museum of Art will see. Using photographs and magazine pictures as source materials—sometimes just as they are, sometimes manipulated or made into a mélange—Mr. Wood (b. 1977) creates flat, graphic, realistic images with a dollop of Pop. He uses bright, appealing colors. He sometimes compresses or distorts the spaces, but not in a disorienting way—doors, windows, trees are just a bit misaligned. He makes paintings you want to hang in your modern home. 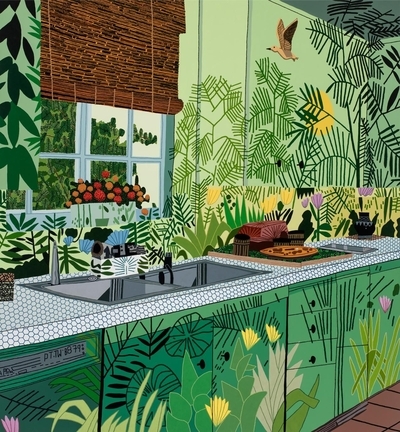 A stainless-steel kitchen sink, for example, has rarely looked as attractive as it does in "Jungle Kitchen" (2017), which is based on an image Mr. Wood found in a 1970s design magazine. The sink is engulfed by verdant ferns and broad-leafed plants, both real, seen through a window, and on wallcoverings that are dotted with yellow and purple flowers. The highly patterned "Untitled (Fish Bathroom)" (2009), which is dominated by a shower curtain awash in red fish, is almost as appealing. "Japanese Garden" (2017) trumps them both: This enchanting scene of greens and blues seems contemplative, even a bit mysterious. On closer examination, many of Mr. Wood's interior and landscape paintings have a slightly disquieting feel. They generally lack people. 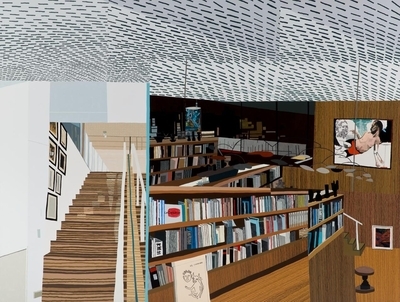 A few, like "Ovitz's Library" (2013), which portrays a modernist room in the Los Angeles home of the erstwhile Hollywood agent Michael Ovitz, seem sterile. And yet, painted with brio, Mr. Wood's paintings suggest not alienation, but detachment. Mr. Wood's proclivity for things over people diminishes, of course, in his portraits, which occupy two of the five galleries in this exhibition. One focuses on family, and these works play up Mr. Wood's interest in psychology and the passage of time. The pairing of "Robin and Ptolemy" (2013) and "Robot" (2013-16), for example, addresses the unspecified "complicated" relationship he had with his mother, Robin. She is portrayed in profile, with her face all but hidden behind her tightly hugged cat. 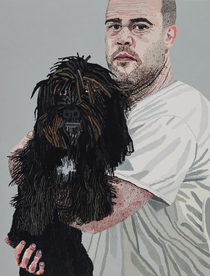 "Robot" shows Mr. Wood meeting the viewer's gaze, a shaggy dog in his arms. The message: He's friendly and open, she's not. In "Sears Family Portrait" (2011), the smiles on the faces of Mr. Wood's parents and siblings may be pasted on, like those in so many staged photographs, but the work is less judgmental. So are his other portraits here, which portray artists, such as his friend Mark Grotjahn. Straightforward and benign, they are less interesting than his interiors and landscapes. The third body of work here comes from his "Clippings" series: big, bold works portraying a single flower, with foliage, on a blank background. They are meant to impress, to hold a wall, and they do. Calculated wall power, in fact, could be a theme of this exhibition. Mr. Wood is a sports fan—baseball cards, basketballs and players figure in his works, though not in the 35 paintings chosen by curator Anna Katherine Brodbeck for this show—and you can see him swinging for the fences. Soon after arriving in Los Angeles (from Boston, originally) and beginning his career, Mr. Wood painted "The Still Life" (2007)—an assortment of crates and plants, with chair, screen and skull—which he brashly called "the still life to end all still lifes." That was probably tongue-in-cheek, but Mr. Wood constantly drops heavy hints about his ambition with his allusions to giants of art history. He cites Alexander Calder as a major influence, and both "Ovitz's Library" and "Clipping E2" (2013) incorporate Calder mobiles. Other images, in pose or color or composition, refer to the work of David Hockney, Stuart Davis, Picasso, Rousseau and Vuillard, to name a few. 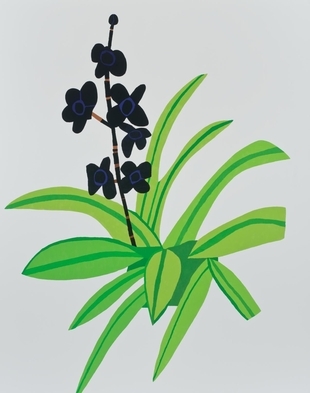 Patterns repeatedly run through his paintings, as they did Matisse's, and Mr. Wood's "Clippings" series recalls both Matisse cutouts and Ellsworth Kelly plant drawings. Like Jasper Johns, Mr. Wood uses hatchwork—for example, to create the snow-laden tree branches of his lovely "Snowscape With Barn" (2017). That painting also contains what may be his most brazen reach for greatness by association. In a famous story from 1832, as John Constable was laboring to enrich the colors of a nearly finished masterpiece at the Royal Academy, J.M.W. Turner upstaged him by adding a bright red buoy with one daub to his own almost monochromatic seascape hanging nearby. Could it be a coincidence that Mr. Wood plants a red shovel in his snow scene in about the same spot on his canvas as Turner's buoy? One can't blame Mr. Wood for great aspirations, but something else is troubling about this exhibition, and it's related. The museum says it chose Mr. Wood for his first major museum exhibition, from a universe of hundreds of other rising contemporary artists, because several Dallas museum patrons collect his work. And with loans from several high-profile collectors from elsewhere around the world, and major support from his powerhouse New York gallery, the exhibit seems too close to the market for comfort. This may be the way of the museum world today, but it makes it hard to avoid skepticism about the long-term merit of these agreeable paintings.